Clever name huh? I know. You know what time of year it is, don't you? Cooler weather, FINALLY. Leaves falling off the tree. Chilly breezes at night, rain and clouds. You are right, it is SOUP season! Some people call it fall or autumn, I call it soup. Soup weather, soup season, soup, soup, soup. I especially like soup with noodles. TONS of noodles. BUT, have you ever had leftover soup and the noodles soak up all the broth and get mushy and overcooked and, oh what a pot of gross it becomes. Well, I found something that won't do that. OK, my 4 year old great niece is laying here by me. The rest of the Husker fans are in the living room, we choose NO Husker game. So I just said to her, "What do you have to say about soup Leyana" Here is what she has to say, "Chicken noodle soup, chicken noodle soup, chicken noodle soup with a soda on the side". I love spaetzle. I am seriously like....addicted! Have you ever used it in place of noodles in soup? 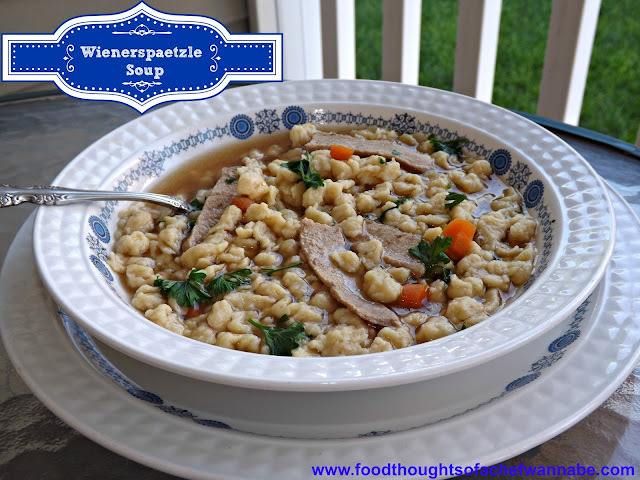 I wanted to combine Wienerschnitzle and Spaetzle into a soup, but you can use them as noodles in any soup! They never get mushy, never bloat. They freeze and store beautifully! Give this soup a try, it is so good, nice texture and flavor. Make sure to salt and pepper to your taste!! 1 lb pork, cut into strips or chunks. In a large pot, bring beef and chicken stock to a boil, add in carrots and pork. Let simmer, covered for 15 minutes. Prepare spaetzle dough and after the soup has cooked 15 minutes, make your spaetzle right into the pot. Gently stir, and when all spaetzle is made, let cook for 5 minutes covered. Add parsley just before serving.